The marketing tools available to brands are expanding at an ever increasing rate and the amount of assets businesses can use, is vast and expanding. So if you’ve not been keeping up with marketing trends as small business owner, brand or marketing manager – what should you adopt, steer clear of and dip your toes into for 2017? …These marketing patches, tools and add-on’s are increasingly allowing brands to execute increasingly forensic digital strategies which in turn provide meaningful and personalised experiences that lead to more sales, brand capital and growth – so what do we predict is on the horizon to accelerate your marketing strategies in the coming year? As a company sitting at the heart of the marketing and data industry, we expect to see several trends in 2017 that will impact how companies and marketers do business and will provide brands with further ROI, with the ability to successfully react and respond to their marketing activity more effectively. We’ve outlined the key trends below… but please do add your own. Video’s use is the biggest area we predict that you need to invest in, and there’s no sign of it slowing down next year. VOD channels and content platforms are leading the top visited sites, think Twitter, YouTube and how can your brand leverage this to your own benefit? Shared content is good, but own-creatiion content is better – and best of all, it’s all largely free to use. It doesn’t have to be all polished productions, lo-fi is big news. Look at the vast array of ‘unboxing’ channels on YouTube – who knew… who cares, well actually quite a lot of people! A YouTube channel ‘Ryan Toys Review’ (with a complete disregard for grammar & punctuation) has more than 2.5 million subscribers and 4bn video views – yes that’s 4 billion! Startling figures given that his channel only launched in March last year. Says more about our fixation with consumerism than anything, but it’s big numbers when you consider 50% of your paid display advertising assets are still not seen by the right audience. Big screens, 4G, more video content – (see above) are leading to a mobile-first strategy for all digital marketing, this applies to B2B as well as B2C markets. Mobile is next in the battle for top spot for your attention and as we send millions of email per year, mobile is the receipt device of choice, desktop for engagement, mobile for attention. With most videos watched via mobile devices than from desktops, location-based adverts and services will be even more supported with mobile specific commerce. This will lead to messaging through targeted interaction while end users are on the go. we predict an upsurge in push messaging and SMS. But if it’s opted-in and relevant, consumers care less, discount codes as you enter a store, why not? Consumers accept the data-sharing trade off, they appreciate it’s a value exchange and that’s what the Block-Caller button’s for, isn’t it? With AI, chatbots, more automation is coming yr wy. Video will account for 69% of all consumer internet traffic next year, and video-on-demand traffic alone will shoot up exponentially. Data and technology will see an increasing number of data sources fusing to create real-time tracking of you with that satellite tracking device in your top pocket. Better analysis of this data, a relaxing of permissions on tracking, enabling cross-device IOT measurement, both on and increasingly offline, will lead to enhanced profiling, especially with the seemingly passive term ‘location-aware’ as the default option for most apps and downloads. Keep an eye on that fridge, it’s doing the same to you. Think Periscope, Meerkat, Facebook Live, Blippar – all have emerged over the past couple of years, quickly becoming a popular way to engage with customers. Live streaming hasn’t fully fledged yet – and we are seeing more robust, less-rushed and thought out strategies. Google decided to ban facial recognition apps from its ill-fated Google Glass device around concerns about privacy issues previously. Our tip is keep your finger on the ‘Facebook Delete Profile’ button. New to the market live streaming platforms and facial recognition software like Blippar will test the data protection boundaries even further. Tech advancements in live streaming field will encourage more brands to test out new ad products in the space, machine learning as the tech market gets to grip with this (which leads us the earlier point about store facial recognition) that Starbucks won’t need to ask your name anymore to pencil it on your Latte. As we work to personalise everything from buying a dealership car and adding your own bespoke experience-touches, to cans of pop or booze – product customisation has transitioned into personalisation and thereby another sales angle, for which you need data. For some businesses, this will mean ensuring touch points are specific and individual, bigger more aggresive strategies include streamlining the purchasing process and making it more responsive.The ecosystem is more sophisticated than ever and next year it’s not set to be changing. As companies aim to connect email, social media, and paid, owned, and earned marketing strategies (among others), they must incorporate technology needed to implement and support it – and data behind every push. Fuelling data and technology, omni-channel marketing will shape a profound restructuring of the value chain. To capture a customer’s attention, brands need to must connect with personalisation and relevant content. It’s all about creating marketing tactics that focus on exactly what consumers are looking for or thinking about. Tracking consumers’ habits, interests and browsing histories is key to creating strategies that get them to close the sale or purchase the service. thankfully that’s where TDP Marketing’s experience is going to help you grow, so drop us on your bookmark list and let’s talk again in 2017. 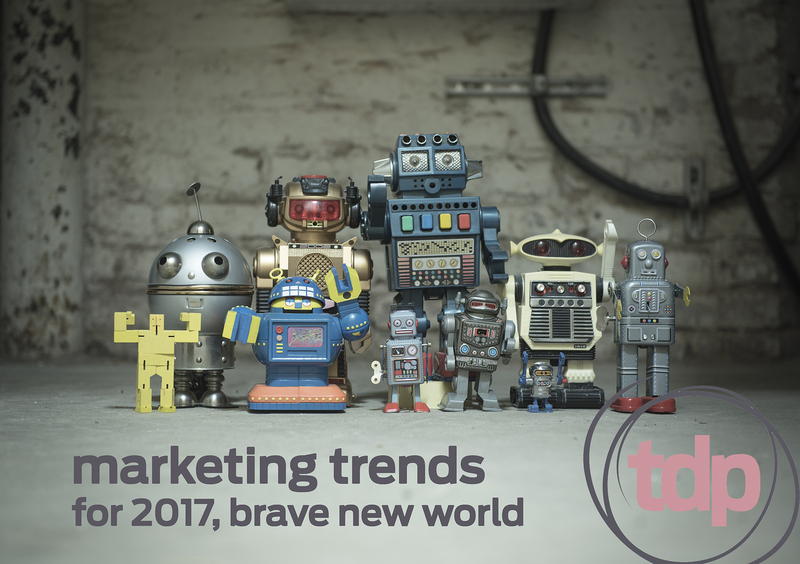 What’s your prediction for marketing trends in 2017?